If you are interested in carnelian as a healing stone, you can find its properties here. Hello all! I am actually still alive! I have been dealing with the young adult life responsibilities of finding a place to live and working in a graduate job. It has been a few months since, but I think I have finally reached a comfortable routine in my life now, and I have a wonderful work area set up for my crafts, so I hope to be sharing more of that with you! Anyway, on the topic at hand, here is a lovely dark red carnelian cabochon that I bought at a local market. Looking at the shape of it, I knew exactly how I would frame it. However, the end design differs slightly from what I originally wanted; the wires weren’t long enough to cover the front, so I adorned the frame instead. I had felt a bit bad about not creating anything new for a while, so I had put everything else aside to sit down and design this in one night. I hope you like it as much as I do! Although I am slightly annoyed that I let the stone fall slightly to the side when I finished the frame, haha. I also bought some rose gold chain to go with the copper wire, I like it a lot more than the dark copper I have been using so far. 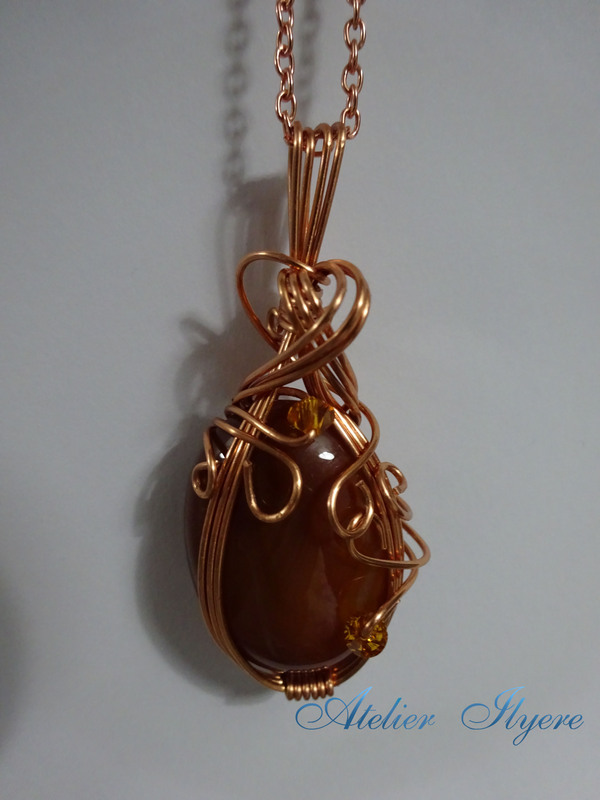 This entry was posted in Gemstones, Jewellery, Pendants, Swarovski, Wire and tagged Cabochon, Carnelian, Copper, Jewellery, Pendant, Red, Wire. Bookmark the permalink.